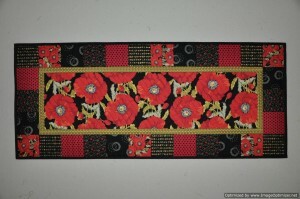 The table runner that I started on January 2, 2012 is finally finished. Sometimes it is not just the larger and more complex projects that sit as UFO’s for a very long time. Here I am at our Guild meting last night showing my completed table runner. We have a UFO Completion Contest at our Quilt Guild this year. Although I took this completed table runner for show and tell last night, it doesn’t count towards the UFO Completion Contest as your UFO has to be from before 2012. Because I started this project on January 2, 2012, I am just outside the time period for the contest. I did show another project at Guild this month that does qualify for the UFO Completion Contest though. I finally took “Plum Dotty” for show and tell at the Guild. Plum Dotty was finished to the partial flimsy stage on July 5, 2011. I say partial flimsy stage because after I had this one together, I put it on the bed and decided that it needed some more blocks to make it wider. Adding just a few more blocks to make it wider proved to be a challenge because I had run out of the black and white and white and black dot fabrics. After getting some help from a friend in Oregon who helped source out more fabric for me, I was able to add the extra blocks. The quilt top then sat for a long time until I had time to quilt and bind it. 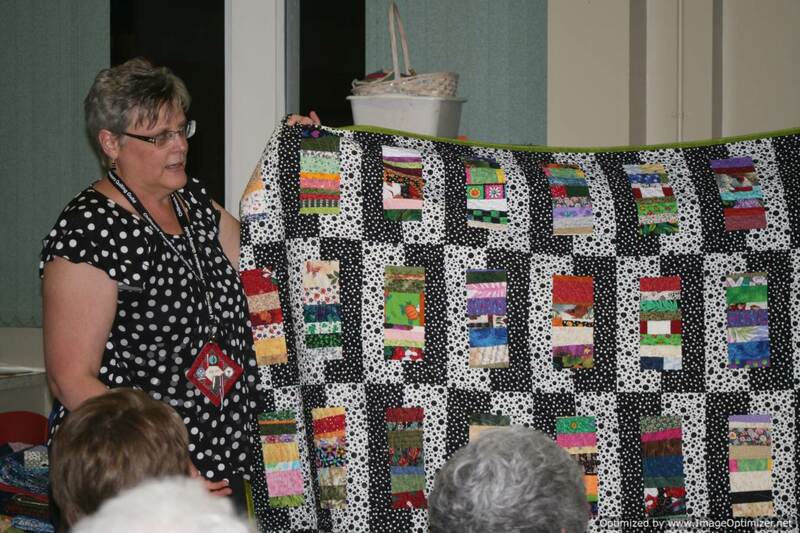 I finished Plum Dotty on September 12, 2013, just in time to show at the Fall Fair in our town on September 13 and 14, 2013. Here is Plum Dotty on the bed. 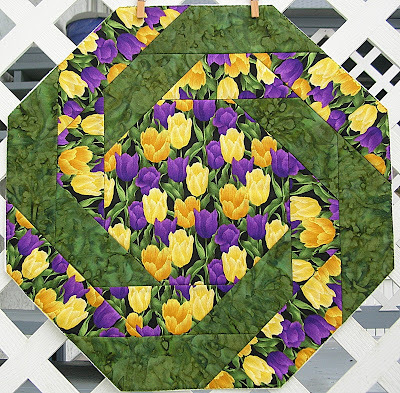 This is a perfect quilt for winter – not only does it brighten the room at an often dreary time of year, but it is heavy with the extra foundation for the blocks and the flannel back. 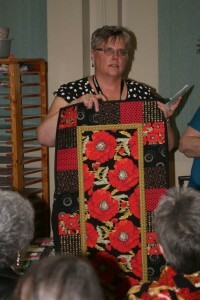 Here I am at our Guild meeting last night talking about Plum Dotty during Show and Share. I wish I could say that finishing these two projects has caught me up to date with my UFO’s, but sadly it barely scratches the surface. This was the only fabric that I purchased in the last week. 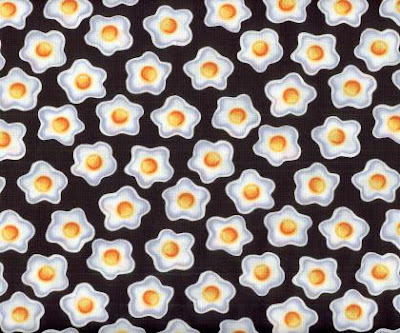 I bought one meter of this fried egg fabric called, “Sunny Side Up” by Susan Pisoni for Fabri-Quilt, Inc. The fabric store that I purchased this fabric from did not have the rest of the coordinated fabric in the line, just this one print. This is a fabric that I noticed once before when I was in the shop and did not make a purchase at that time. When I was in the shop on Friday night, they had just 3 meters of this wonderful fabric left. It is a good thing I didn’t wait any longer. This fabric coordinates perfectly with my chicken collection and I am sure I can use it in a wall hanging for the kitchen or a table runner for the dining room table. On Saturday, it was a very grey and rainy day here. I am fed up with winter, snow, and rain. Bring on Spring! My daughter and I decided that we needed something that would remind us of Spring so we headed out to the local greenhouse. 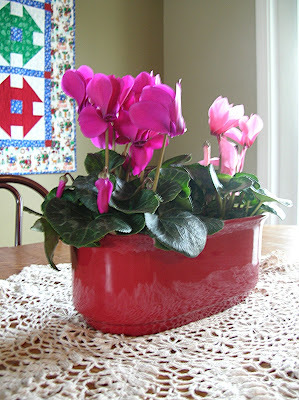 We found these pink and purple coloured cyclamens and the bright red pot that reminded us of Valentine’s day. This would do the trick so we brought them home. As you can see, today (Sunday), the sun came out for a while and is streaming in the windows as I took this picture. I also purchased a new pattern on Friday while at the quilt shop. This pattern is called, Spirals and is by a Canadian designer that manufactures her patterns under the name, “Designs to Share With You”. 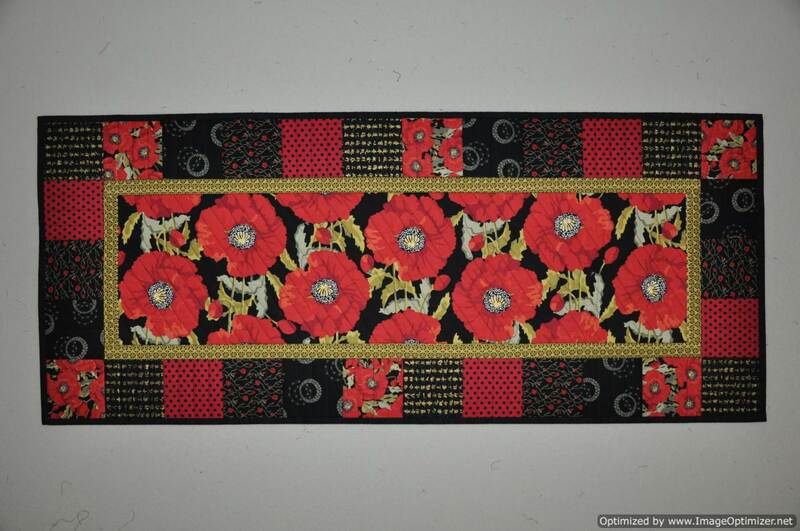 The table runners I have been making are from the same designer. Her patterns are fairly easy to understand and follow. There was only one step that was a bit confusing in this pattern, but I soon figured out what she meant and was well on my way. 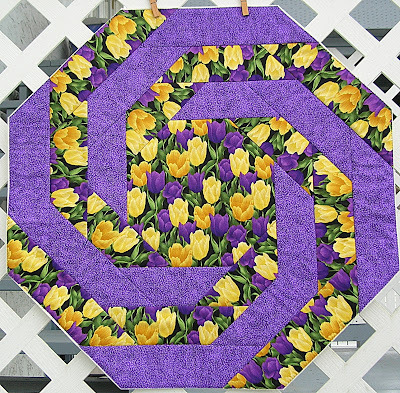 Since I was still in the Spring mode, I shopped my stash for this bright tulip fabric. Perfect for Spring! I made one table topper with just two “rounds” of strips using green as the accent colour. This was my son’s favorite. I made a second table topper with three “rounds” of fabric using purple as the accent colour. This was my daughter’s favorite. While I did buy fabric this week, I did bust stash in that I shopped my stash for the fabric for these projects. I also used up some of my bits of leftover batting to quilt these. Both table toppers are quilted and ready for binding. I won’t be putting the binding on these until I purchase some Elmer’s school glue. If you are curious what I am talking about, check out You Tube and look for Sharon Schamber’s recent three part video on binding. 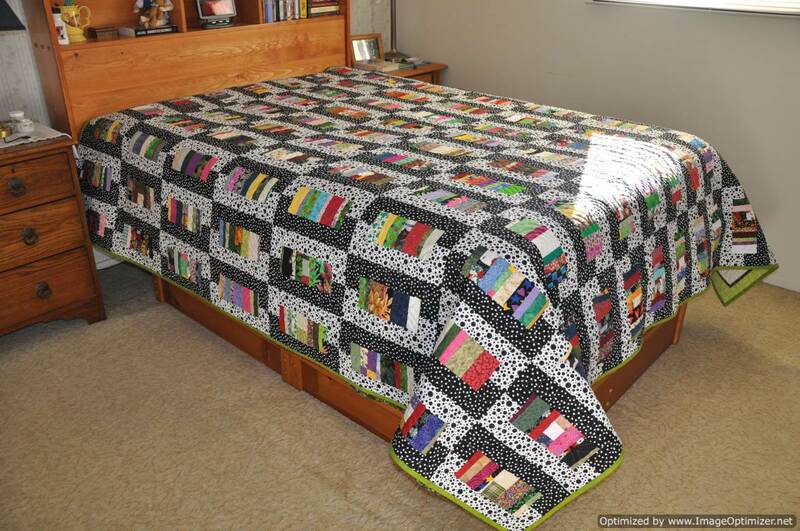 She has some wonderful tips–one of which is using Elmer’s school glue instead of pins. After purchasing bright colourful flowers and working with bright floral fabrics, I feel like spring has to be nearby. At least it was spring in our house this weekend!